Welcome to Americas Best Value Inn Downtown Midtown- located on I-85/I-75 N/Atlanta off of exit 251A toward 17th Street NW. We are only 13 miles from Hartsfield-Jackson Atlanta International Airport in downtown Atlanta- Georgia. Start your day with our free continental breakfast. Our decorated spacious guest rooms feature all of the comforts of home including free Wi-Fi access-hairdryer- coffeemaker- flat screen cable TV with 60 HD channels- alarm clock radio- work desk with lamp- table with chairs- and free local calls. Microwaves- mini-fridges- irons- and ironing boards are available upon request at the front desk. We also offer handicap accessible and non-smoking rooms at our downtown midtown hotel where kids 11 and under stay free with an adult. Pets are welcome- restrictions may apply. Guests are allowed to park one car per room at no charge. Additional vehicle parking if available at 30USD per car. Explore the Atlanta zoo- or Centennial Olympic Park- and cool down in the interactive Fountain of Rings. If you are traveling with children or if you are just a kid at heart- we are within 5 minutes of fun attractions like Georgia Aquarium- where marine creatures frolic in simulations of their natural habitat. View whales- manta rays and penguins in the largest aquarium in the world. Visit the King Center to learn more about Martin Luther King and his role in Americas battle for civil rights. Take the five-minute walk into Midtown and browse one-of-a-kind shops- or just enjoy downtown Atlanta for unlimited sightseeing opportunities. For example- take a CNN studio tour or discover the World of Coca-Cola. Spend a day thrill-seeking at Six Flags over Georgia- or Stone Mountain theme park- even visit the campuses of Georgia State University or Georgia Tech. You can find something for everyone near our downtown midtown hotel. At Americas Best Value Inn Downtown Midtown- We-ve Got You Covered from the time you hit the road until your head hits the pillow. 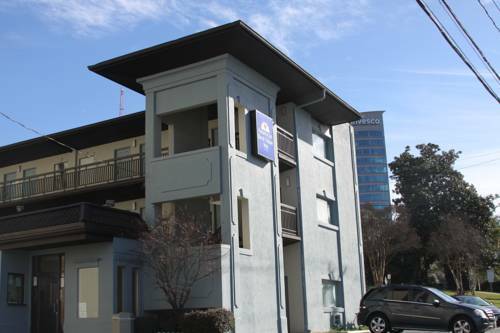 Americas Best Value Inn Downtown Midtown is located on I-85/I-75 N/Atlanta off of exit 251A toward 17th Street NW. Our address is 1641 Peachtree Street- Atlanta- GA 30309.